I admit that when I first cracked open Leaders Who Last , I wasn't sure if I was reading a book that was meant for me. I pressed on though and, in the end, I was glad I did. This book is written by Dave Kraft, who is a "leadership development" pastor at Mars Hill in Seattle (serving alongside Mark Driscoll). I had not heard of Kraft until reading this book and from what I read, I took away that he has a lot of life under his belt, having served in the ministry for over forty years. At this time, he enjoys spending his time mentoring leaders and shaping hearts and minds to be in a position to lead and to lead well. I like this man's purpose! I do! As he points out in the title of the book, only 30% of leaders last. It's hard to be a leader and it's hard to finish the race well. Hence, Kraft feels called to minister to those who feel called by God into ministry. He says he won't spend time with people who just feel like leading or who are not hungry to learn more of who God is. Kraft wants to invest his time wisely and that is something I can very much appreciate! Although there are certainly ways in which we are all leaders (of children, in our communities, etc) this book is written specifically to ministers of the Gospel. That's not to say that the "common man" cannot stand to learn a thing or two from the book. However, Kraft is writing to and for a specific kind of leader. At first, in my Know-it-All-ness, I thought the book read as some kind of basic advice. But as I read further into the book, I realized that some of what he might be saying may sound simple on its face, it really isn't. 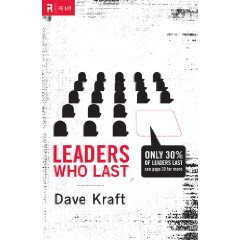 For anyone who has suffered the loss of a leader because said leader did not follow the principles and truths Kraft presents in this book, you'll know that as "simplistic" as Kraft's words might be, they could stand some repeating. Sometimes it's the simple things that trip our leaders up. 1. People in the church, sitting under the pastor, should be quick to speak their minds. 3. People in the church should be quick to confront their pastor over anything that they personally deem to be worthy of confrontation. It is telling the pastor/leader that they should purpose to build a solid set of friendships to help keep them accountable. 1. That everyone is given a gift and are called to use it for the glory of God. We are all part of a body. What is the use of a head without hands, arms, toes and, yes, even the bellybuttons attached to it? We need to know what our gifts are, and stand ready to use them when opportunities present themselves. 2. We need to realize that some friendships are beneficial for pastors to have. We just have to get this point, people! Some friendships are more beneficial than others for a pastor to have. See, everyone wants to be friends with the "popular guy" right? Resentments can grow if you see that your pastor is "better friends" with so-and-so. You can easily start to feel left out if you let yourself go there. Don't. Your pastor needs friends like you need friends - to love him and to hold himself accountable to. Who he is friends with is between him and God. So we should be praying that our pastor makes the right kinds of friends, instead of bickering over who they are, or allowing ourselves to feel hurt because they aren't the ones we might have chosen for him. 3. Those who prove themselves trustworthy will be noticed as having critique worth listening to. Do you have a strong opinion about some aspect of your church that isn't going the way you would like it to go? Are you even involved, or are you just sitting on the sidelines, complaining about something that you don't want to work for? If you care, get off the pew. The last thing the church needs is another pew warmer. Got a problem? Find a way to minister and to serve and work towards solving the problem. Once you are working towards it (in a respectful and profitable way, mind you!) you might find that the problem wasn't as big as you thought. Or, maybe you will be changed in the process of serving. Those of us in the pews have a lot to learn. Perhaps if we learned how to serve and love our leaders, more of them would make it to the finish line. The problem sometimes starts in the pew, folks. Books like Leaders Who Last are good for all of us. They are good for the pastors who need encouragement and mentorship from someone who has "been there." Then, books like Leaders Who Last help to open the eyes of those who sit in the pew. Do you want your leader to last? In some respects, it starts with you. Interesting... Pastors and their families need real friends. Speaking from personal experience on that one. Sounds like this one is chock full of sensible, stabilizing advice. I had no idea that only 30% of leaders last. ! hanks for participating in the Saturday Review at Semicolon. I about skipped this review for the very reasons why you thought it might be for you. Glad I read on...I think that this would be a good book for me to read so I know how to encourage my pastors. Besides, I may be married to a pastor some day.